Don’t know how many of you are interested in vintage stoves, but last year @LindaWhit asked for more information on Chambers, so here you go, Linda. Heavy, simple construction = straightforward repairs & no more sending an appliance to the landfill or replacing electronics. I love the way old stoves look! even after hiring someone to restore my stove it was cheaper than the cheapest home-grade “commercial” stove. My Model C has three daisy burners, a thermowell, a broiler w/a griddle, and a single oven (the hatch on the right is storage.) The gas levers are child-proof: to turn on the gas one must press and hold the thumb-piece. The broiler was a selling point for me. The old stove had an underpowered broiler accessible only by a contortionist. The Chambers broiler is right on the top, opens w/the turn of a handle, adjusts the removable plate up and down according to the thickness of the food/desired heat, and is quite powerful (15,000 BTUs). The broiler heating element also heats the griddle on the stovetop. 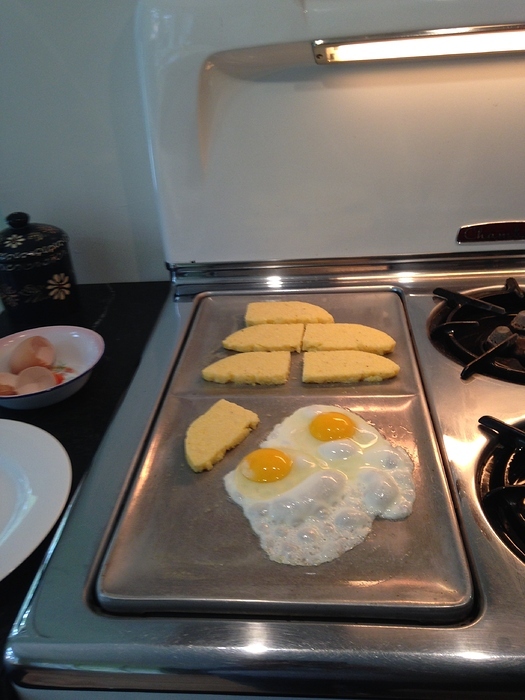 Many Chambers users cook their bacon in the broiler box & their eggs on the griddle. 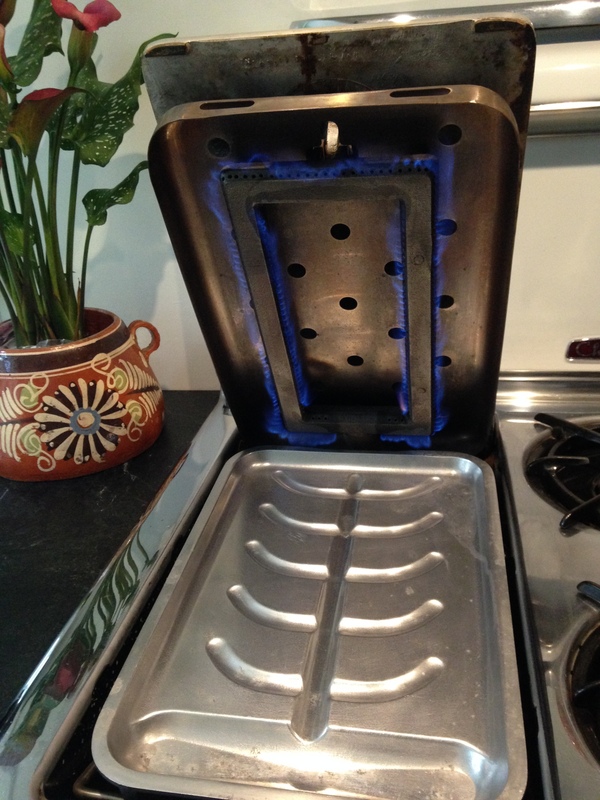 Some replace the aluminum griddle w/a cast iron model from Nordic-ware. I don’t use it much, but if the burners are in use it comes in handy. The thermowell is the other special feature I love. 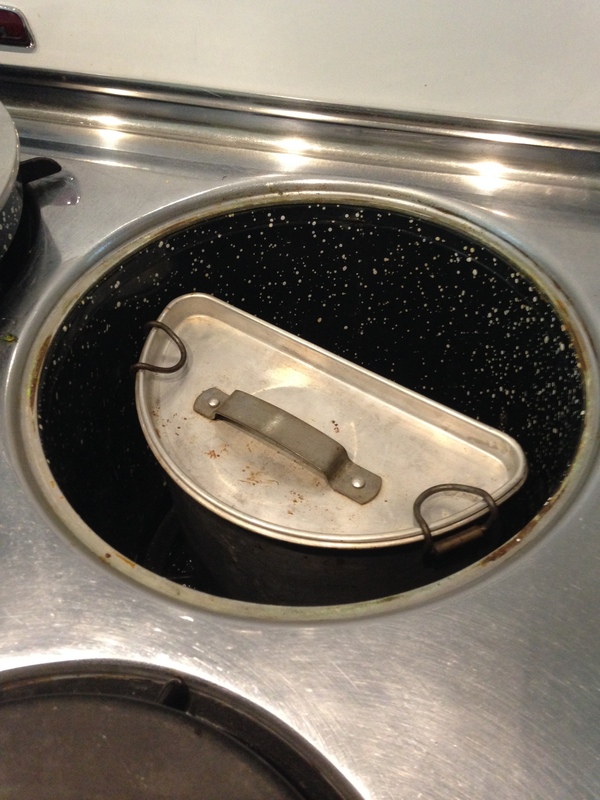 (The picture shows the lid off with a half-kettle inside.) The thermowell and the oven are super-insulated with rock wool, so that you can cook most items with only a few minutes of gas, and then let the food slow-cook over a period of hours (if you choose). I like to drop sweet potatoes into the well in the morning, gas on for about 4 minutes. They are perfect a few hours later. There is also a device to support pie plates so you can use the thermowell as a secondary oven for baking. I make cornbread all the time this way. There’s a Chambers cookbook w/suggested gas-on cooking times for most foods. It’s helpful. The daisy burners on a Model C output 9,000 BTUs. There are models that include one high-output burner as well. I cook primarily w/copper & because it is so conductive, copper heats w/a whisper of flame, so output isn’t an issue for me. The open daisy certainly puts out more heat than my previous middle-of-the-market stove burners. I’ve seen posts by home cooks who require higher BTU burners (large families, big quantities, etc.) It’s a decision point. The oven is highly insulated. A thick sheet of cast iron on the bottom aids heat distribution and retention; baffles keep air distributed when the gas is on, and close for retained heat cooking. The box is small, approx 18x15x11.5. This is possibly an issue for bakers who make big batches of cookies. You can cook a 25lb turkey in a roaster by removing the racks and placing the roaster directly on the cast iron bottom. I’ve not hit the limit on oven capacity yet, possibly because the Thermowell functions as a secondary oven. More technical info especially for bakers: The thermostat operates differently compared to modern ones: when the set temp is achieved some gas heat stays on; additional gas is ignited to maintain the set temp. I’ve read that modern thermo’s cycle flame on and off, resulting in more temp variation. (This information is from a repairman with extensive knowledge of vintage and modern equipment. I am not an expert myself. Google it if you are curious to know more.) Some bakers prefer the older ranges for this reason. I don’t bake much so I’m not testing its limits. YMMV. Availability / Cost: there are areas of the country that are rich w/Chambers stoves (east coast, midwest, Texas). Price is confusing. I bought mine, which had been barely used, for $300, and then engaged a local person to refurbish it at a total cost less than $2,000. But I’m lucky to have a serious hobbyist in town to do the work. 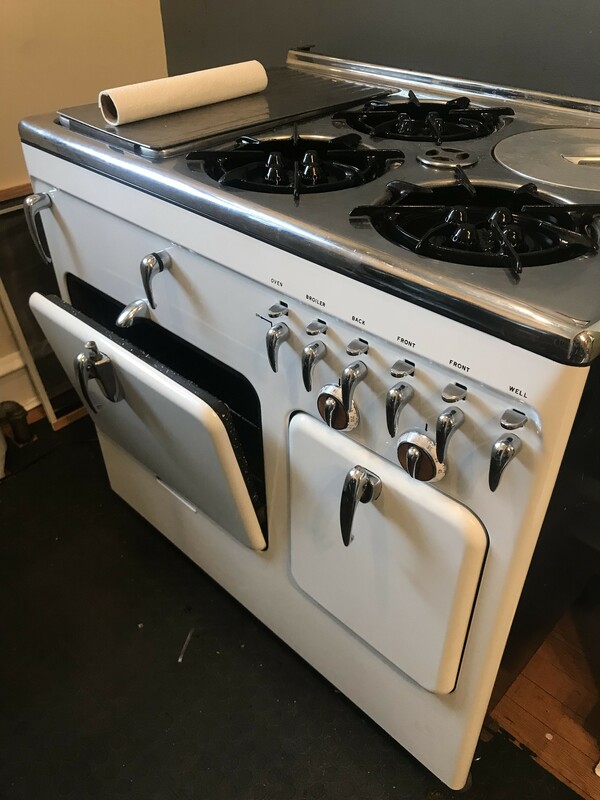 If you can’t find a good stove on Craigslist & can’t find help, and you don’t have the nerve to work on a stove yourself, than your option is to buy one from a restoration house = $$$. If you love a puzzle, the original repair manuals are easily had, you don’t have to have specialty tools, the mechanisms are straightforward, replacement parts can be purchased, and there are hundreds of folk out there who have re-built stoves from scratch who will talk you through the process. Also the forums have step-by steps w/photos. NOTE: most repairs relate to the exterior — the chrome top, enameled steel panels — anything subjected to weather. The interior guts of these monsters are solid brass or enameled cast iron = indestructible. Cleaning gunk is a lot of the work. One reason I bought this stove is my previous stove was crap on toast: poor construction, computer panels = landfill. The Chambers weighs 650 pounds. It will still be functional when the stars burn out. Also google Chambers Rangers and Chambers Commune for forums. Thank you. I doubt I’ll ever own one but I wish I could try it out! What a fabulous, informative post! Thanks so much for taking the time. It is in very good shape and beautiful! Which era is yours? Now, you have no choice but to get one! Jealous! Baaahaaahaaahhhh!!! Galley kitchen in my townhouse. Ain’t gonna happen. I just look at pictures. And wipe up the drool. Naf, this Model C is from 1951. The technology didn’t change much beginning in the 1920s. The brand was sold in the early ‘60’s and production ended. They were high-end in their day; cost roughly $4,000 in today’s dollars. Mine still had the instruction sheet for installation on the back! Guess I’m posting because a lot of these beauties are going to the salvage yard. It’s a shame. I am curious, what kind of service do they provide in the ‘restoration’? I have a Wedgewood that I am interested in having some service done on. 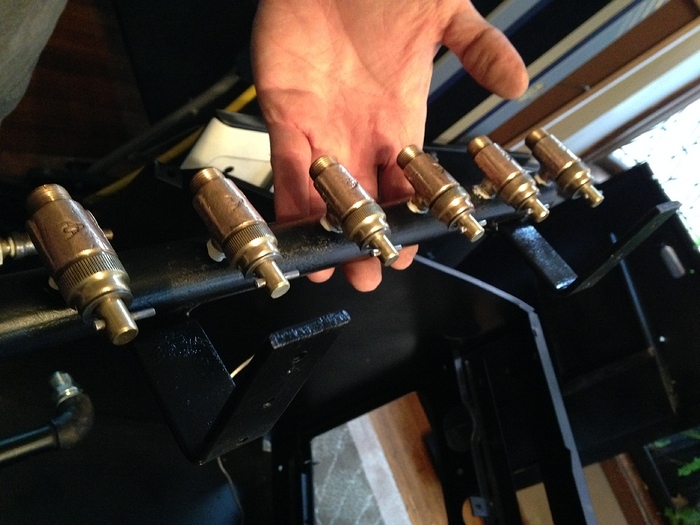 SCK, the person who restored my stove is famously OCD. It was hardly used, but after 65 years it needed a thorough cleaning. I didn’t choose to have the chrome re-done because it’s fine. He took it completely apart, cleaned every moving part (with a teeny tiny wire brush), replaced/re-packed the rock wool, tested the thermostat, and reassembled it (put the big chunks together in my kitchen so it wouldn’t have to be moved on a dolly). Reassembly and testing each burning took a day-and-a-half. 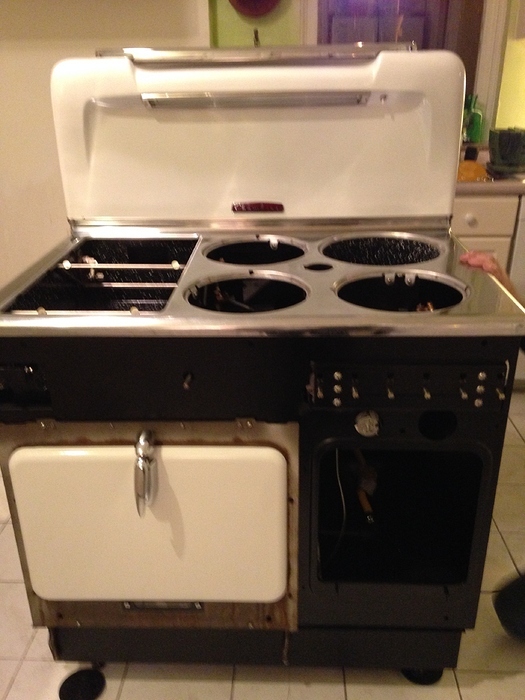 Some of the people on the forums who restore stoves do either a full-on job or a “just get her up and running” service without the aesthetics. How do you like your Wedgewood? I think they are gorgeous! I actually started the vintage stove odyssey with a double oven Wedgewood from 1952 that I restored myself. I absolutely loved the WW until I saw a pastel yellow Chambers in Baltimore and was so intrigued by its looks that I decided to find a good Chambers for a test run before committing to either in anticipation of a kitchen remodel. I found a nice white 90C in Baltimore that was still connected and so I hauled it up to Philadelphia and have used it for the last year until the kitchen demolition began recently. The Chambers wins hands down: it is simpler, crafted at a much higher quality level, remains cool even when the oven is in use, has a thermowell, is more fuel efficient, its daisy burners are sufficiently powerful and efficient, and is drop dead gorgeous! There are a couple of things that I did miss about the WW at first. 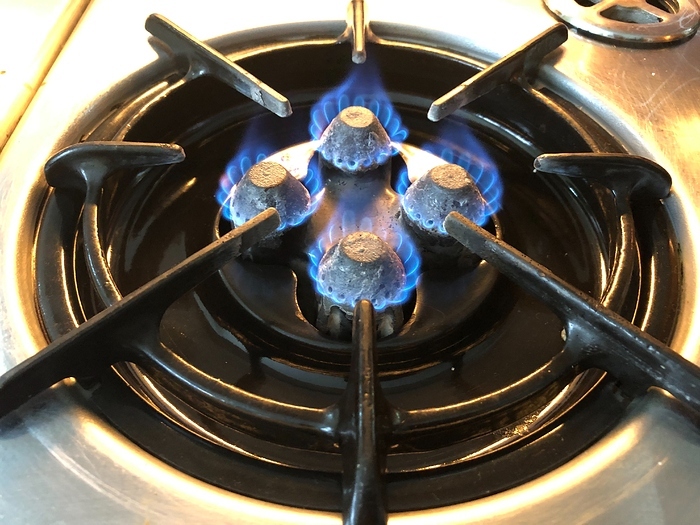 I love the stove top Harper Wyman burners with the center simmers and I liked the fact that the WWs are very easy to keep clean as most of the under burner surfaces are enameled and there are pull out crumb trays to capture spills. The level of fit and finish however is not quite as high as the Chambers and the stove generates a lot of heat with 4 standing pilot lights for the model I restored. The ovens, though far superior to modern ovens in terms of evenness, throw a lot of heat into the room when in use. In the end, I can’t ever imagine cooking on any other gas stove. BTW, I just met Doug in Pittsburgh who helped me disassemble and move a yellow 90C that will become my forever stove for the kitchen renovation. My white 90C was purchased by a friend and is now happily ensconced in its new home in Wilmington, DE. Hello Gregory! Welcome to Hungry Onion. 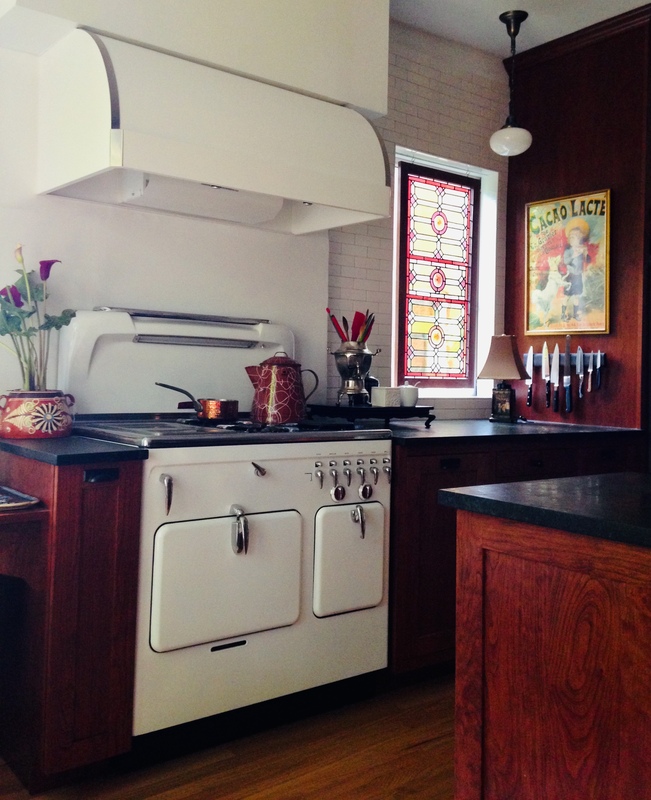 If you have photos of the vintage stoves and can post we’d love to see them! I think the internet and the ease info can be shared is making the vintage stove journey a bit more doable. A dear friend had to switch to a new stove in the '90’s because she just couldn’t find anyone to repair her Wedgewood. If she were in the same boat today I think her story would have had a different ending due to the internet and other vintage stove fans. Gregory, I envy those crumb trays. Good to know the differences in the stoves. And so glad you found Doug! He’s a gem. Remodelista recently posted on replacing kitchen appliances. Their benchmark for the lifespan of a gas stove? 15 years. 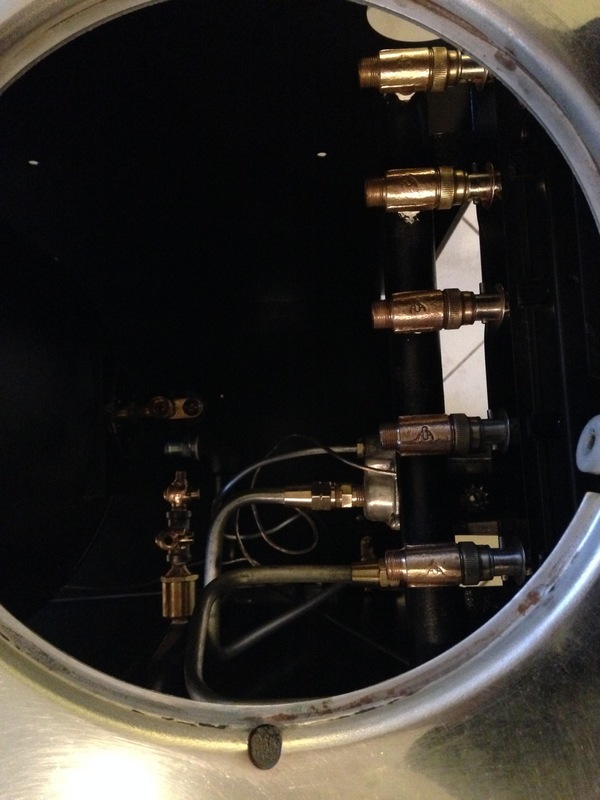 Exactly how they build a gas stove that lasts only 15 years is quite mysterious. Its just a bunch of metal components with minimal moving parts! I can’t stop admiring these beauties. Thanks for sharing! They really are beautiful to behold but just as wonderful to cook on. The photo above is the white 90C I worked on with my new friend and the new owner of my first Chambers stove. We replaced the oven door springs.